So his training begins. Good luck Kai. 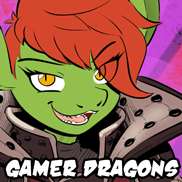 I also added a button to the right of the comic that changes when a new Gamer Dragon is uploaded. Yay for dragons and for comics. I wish that you updated more often, but the quality of story and art are hard to fault as is, so keep doing what you’re doing! and driving himself into the fire. give me ten around the court. some guys just won’t be taught. and that goes for Dragons as well. Considering dragons need to be able to take off vertically with the force generated by relatively small wings, they end up being much lighter than they appear… Maybe 1~2 tons at most? no ship that would crumble under that little weight would be worth shipping. I’m also hopping aboard the S.S. Clai, but I think it’s also possible that the “Urk” could just be not wanting to take another punch from Kaya. xP Also, if Kai’s half as stubborn as most of the dragons I know, including myself, and Rex as stubborn as he appears to be, then I have a feeling “Shrimp” and “Doggy” will be nicknames to stay. I can only assume that if they do get used to calling eachother that, they’re still not going to take those names from anybody else. xP Keep the story coming, Robin. It’s the one reason quite a few of us are able to look forwards to Monday. xP I love all the depth and attention to detail you put into both the comic and your characters. Each new release tells us a little bit more about them. Stay awesome. Rex had better hope he never meets any of the robots from Freefall. Well, good luck Kai, you’re gonna need it. I’m willing and available. The price is $1024. At least Helix is not doing it anymore (and most of the robots in the main cast). I like the last panel; good way to end this arc. Nice job, Robin! On the bright side, Kaya managed to fix Kai’s sleeve again! Yeah, she did. Quest complete! This is just an idea but how about a bear hybrid who hates the heat, loves the cold and blames nearly everything on global warming? – Rex is starting to get frustrated that, while Kai -is- rising to his bait, Kai is repeatedly responding to the wrong insult! – Kaya seems to be considering something of a crush on Rex herself! I’m looking forward to every update. Well, Cleo apparently has found a true friend in Kaya and has the hots for Kai. Meanwhile Rex is going to break Kai over and over again until his stamina picks up. My advice to Rex? Take some physiology classes and know when to stop. The idea is to push your troops but not to the point of self-destruction. They need to recognize pain and the types of pain. Some pain is the “no pain no gain” kind, while other pain is the kind that signals genuine damage. But it sounds like Kai is currently holding his own. Rex is not out for blood or anything. He never let anyone run until they collapse. So no worries, shrimp dragon is safe. Robin are you a wife and a mother? If so maybe your husband and children can help you with Twin Dragons. I’m fairly sure Robin is a guy. Robin do you have any hobbies? Aside from the comic and drawing, I like to play games and watch movies and anime. I also read manga a lot. Nothing quite like being so confident in yourself that you insult the team captain every time he insults you. LOL. I should really update it. I just now thought of it… Might Benji be just a little insulted by Kai’s emphasis on the “doggy” insult in panel two? Hup, 2, 3, 4. Hup, 2, 3, 4… Come on you runts, faster! Kaya and Cleo make me laugh. You are too good at this, Robin.